Is there anything more American than baseball and apple pie? Well, if there is anything more American than Mom and apple pie it would have to be the traditional American muscle car. Muscle cars are performance vehicles that embody the American spirit: they are fast, sturdy, and powerful. But the debate regarding the first “true” is one that will most likely not be settled anytime soon. Popular opinion is divided as to whether the Oldsmobile Rocket 88 or the Pontiac GTO was the first true muscle car. Historians believe that the first muscle car was built by Oldsmobile in the late 1940’s. During the early twentieth century, V8 engines were more commonly used in aircraft and boats than they were cars, but Oldsmobile was the first automaker daring enough to put an overhead valve V8 engine into one of their cars, the Oldsmobile Rocket 88. Oldsmobile was onto something great; that overhead valve V8 engine gave their Rocket 88 unprecedented speed and power for the time. The Rocket’s speed and performance shamed all even the pure racecars of the time, bringing home wins from both NASCAR and Daytona. The public quickly began to take notice of Oldsmobile’s new Rocket and they weren’t alone. Not content to let Oldsmobile have all the glory, other American automakers began manufacturing their own muscle cars. As muscle car fever intensified younger drivers began to buy up whatever models they could find. And muscle cars became status icons from the 50’s onward; it was no longer about how nice your car was, but how fast it could go, how much power it had. Outfitted with drag racing tires, muscle cars like the Chrysler C-300 soon spread across every race track in the country. 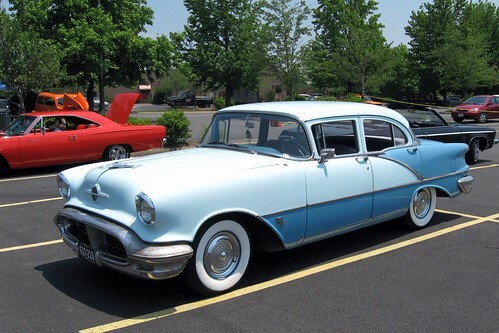 So to many, the first true muscle car was and always will be the 1949 Oldsmobile Rocket 88. General Motors engineers Bill Collins, John DeLorean, and Russell Gee didn’t set out to build a racecar in 1964; instead, they wanted to create a pure performance machine- the Pontiac GTO. In fact, General Motors had banned the creation or production of racecars company-wide. In the early 60’s Colins, DeLorean, and Gee wanted to create a street car with unprecedented power and after months of planning and hard work the trio had a car, but they were missing a name. DeLorean figured that since this new car was a performance machine it should have name like one and he finally settled on Gran Turismo Omologato or GTO, named after the Ferrari 250 GTO. Thus, the 1964 Pontiac GTO was born. To side step the standing GM edict against racecars, the 1964 Pontiac GTO actually started out as an option package for Pontiac LeMans and Tempest. The GTO had a very distinct style and was one of the first midsize cars to feature a powerful V8 engine. 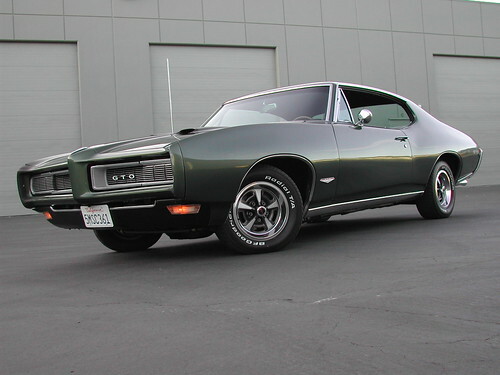 After the GTO was introduced automakers used the GTO’s unique look and style as template for future muscle cars. The GTO is still widely contested as the first muscle as people believe that without the Oldsmobile Rocket 88 that Collins, Gee, and DeLorean wouldn’t have been influenced to create the Pontiac GTO. In either case General Motors can be accredited with the creation of the first muscle car, nevertheless there is nothing quite like a 1969 Pontiac GTO with a set of silver custom wheels.